A friend once told me, "Women always have aspirin in their purses." By that, he didn't mean that we suffer from headaches all the time, but that women tend to be prepared for "just in case" scenarios. Which is why we pack so much for trips. I'm getting r eady for my week-long class at Country Workshops and have made an ongoing list of things to take along. Items include clothes for temperatures ranging from 50º to 90º and from sunny to rainy (we'll be in the mountains), Ibuprofen (we'll be swinging axes for a week), band aids and flexible adhesive wrap (for nicked fingers), camera and camcorder, way more batteries than I'll ever need, a notebook, and three pens (in case one is lost and one runs out of ink)....you get the picture. I'm also packing lots of tools, many of which needed to be sharpened, which is what I did yesterday. While laying out my tools, I realized that two did not have protective covers for transport. So I spent some of yesterday making very quick, down-and-dirty blade guards for my Mora knife and crosscut saw. For the knife, I made a wooden sheath. 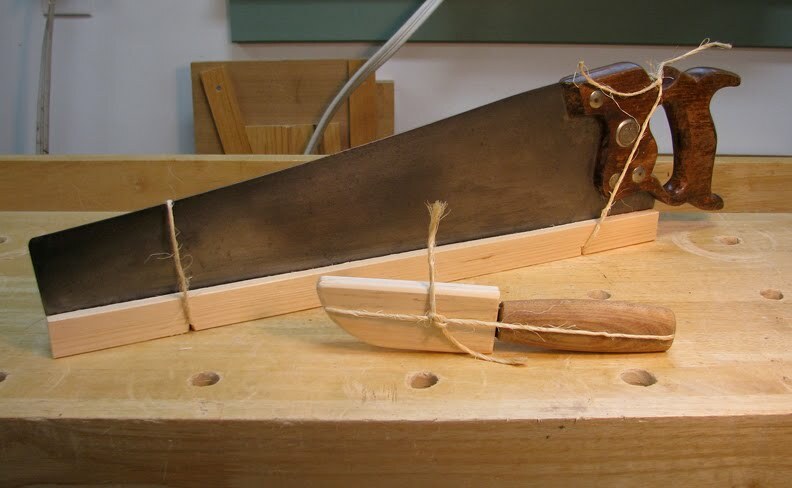 For the saw, I sawed a kerf in a piece of wood, dropped the blade into it, and attached it with twine. 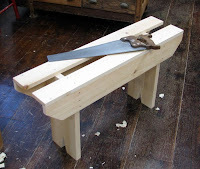 While sharpening my axes and adze, I found that my little saw bench is a helpful accessory. To check my progress, I turned the axe around, moved to the side (so the blade wasn't in line with my face) and wedged the handle between the split in the top and bench's leg so I could examine the cutting edge more closely and touch it up with stones. When the handle slipped, I grabbed the nearest chisel and mallet and started vi gorously and roughly chopping out a ledge in the leg on which the handle could be wedged more securely. My partner walked through my shop at that moment, observed what I was doing, and asked with mild alarm, "Are you allowed to do that?" "It's my bench." I answered. "But, do people do that?" She asked with increasing concern. "The bench is just a tool." I shrugged. She walked away. I hadn't convinced her that I wouldn't be banished from the woodworking community for having damaged my bench. I have no problem with altering tools to meet my needs. 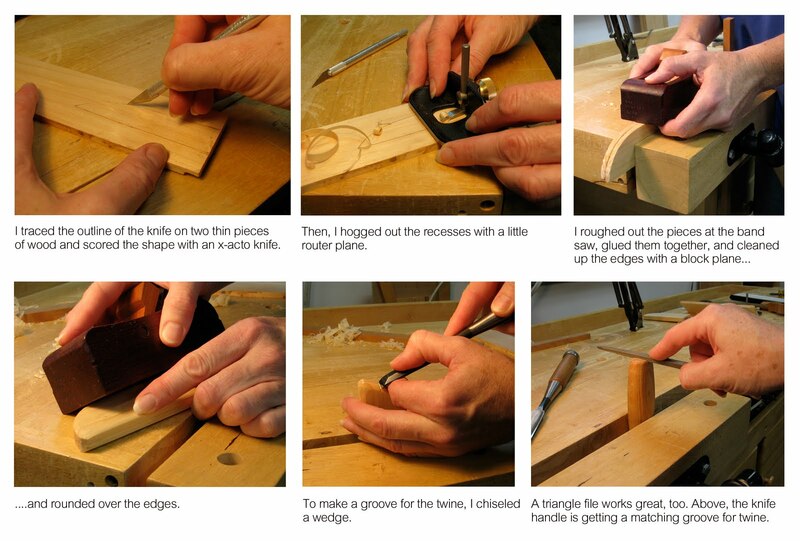 If it makes a tool fit more comfortably in my hand or work more efficiently, I'll reshape, regrind, or recreate it. The only tools I wouldn't touch are in the collectors' category, but I don't own any. For the class, we were asked to bring branches for the spoons we'll carve. I discovered that the split in the top of the saw bench works great at supporting a branch—much like a V-block—when sawing to length. The bench works so well at so many tasks, in fact, I'm thinking about packing it and taking it with me to class.